Chicken Fettuccine Alfredo is one of our favorite comfort foods, but the classic pasta dish doesn’t make a very good appetizer or finger food. 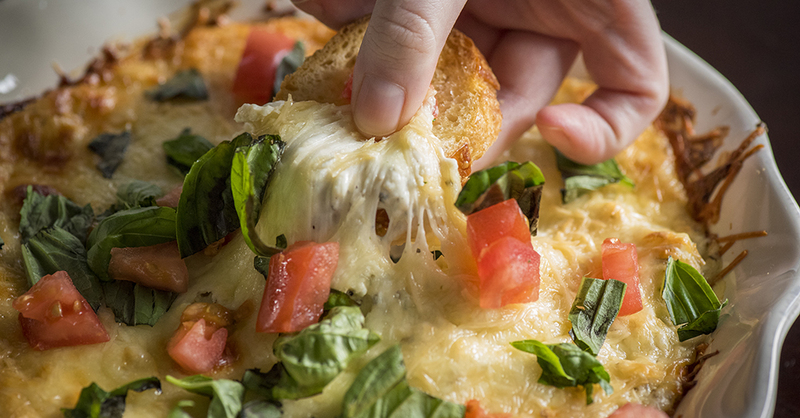 That’s why we created this super cheesy and creamy dip- all the same great flavor, in munchable form! It’s so velvety and delicious, especially spread over baguette slices. We love to bring this dip to parties or get-togethers because it’s such a refreshing twist on traditional chips and dip, and we think you’ll agree! In a large bowl, mix together cream cheese, alfredo sauce and lemon juice until smooth. Fold in chicken, 1/2 cup mozzarella cheese and 1/4 cup parmesan cheese. Pour mixture into 9x13-inch baking dish, then top with remaining cheeses. Place in oven and bake for 25 minutes. Place under broiler for 3 minutes, or until golden brown and bubbly. Remove from oven and top with diced tomato and basil. Serve hot with sliced baguette.